Amongst other things I offer Technical SEO Support at a Very Reasonable Rate. The following links go to URLs that can be used to share the current preview with friends. Click on the link then copy the URL from the address bar. When Google shows your website pages in its Search Engine Result Pages (SERPs) it normally displays content from the page itself. 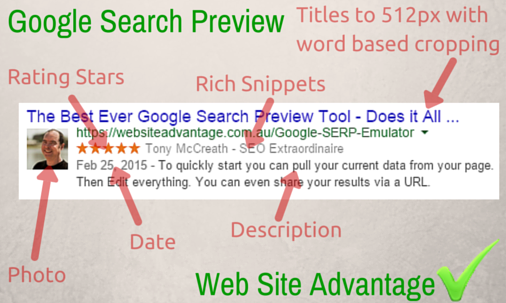 The heading is often taken from your pages title and the snippet is sometimes taken from your pages meta description. What if your page title or meta description is missing, poor or doesn't relate well to the search query? In these cases Google will find another source for the text it displays. This maybe from page headings, visible content or even text in links pointing to the page. Google will only display so much information. Up to 600 pixels for the heading and around 2 lines for the snippet (I estimage about 157 characters). This preview tool simulates the 600px limitation so that you see what your website may look like in the Google Search Results. This way you can fine tune your text to be the most attractive one in the results. If you want to test how an an existing page may look, enter its URL then click the Acquire Text button to have it fill in the Google SERP Emulator with the text the page uses. Google highlights words in the search results that match the words that were searched on. You can emulate this by adding words to the Search Word list. They should be space separated. Bonus: Under the tools fields are some extra stats as well as permalinks which let you share what you have created. I often send my clients a screen shot as well as the permalink so that they can easily copy the text used, or continue testing. I have also written articles about how to write great Titles and Descriptions so that they work for search engines and attract visitors to your website.